The Seattle Seahawks have conquered their first ever Super Bowl title literally annihilating the Denver Broncos with a crushing win of 43 to 8. 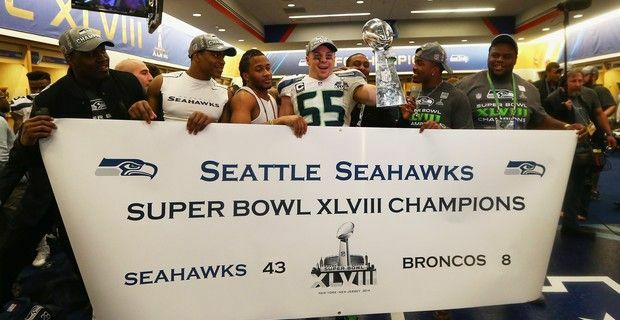 The Seahawks lifted the XLVIII Vince Lombardi Trophy on Sunday evening at the Metlife Stadium in East Rutherford, New Jersey, steamrolling the Broncos offense and destroying Payton Manning’s dream of becoming the first quarterback to win the Super Bowl with two different teams. Just 12 seconds into the game Seattle took the immediate advantage - the quickest score in Super Bowl history - thanks to a wild mess made by the Broncos offense and the opening snap sailing right over Manning’s shoulder, as running back Knowshon Moreno recovered the ball in the end zone and was tackled for a safety that giving Seattle a 2-0 lead. From there the Broncos would never recover and the 82,529 fans in attendance at the stadium began to realize it, as did the millions of football devotees watching the game unfold in football's biggest night, as the league’s No. 1 defense punished the league’s No. 1 offense. By the second quarter Seattle were already leading 15-0 and by halftime they were 22-0 thanks to linebacker Malcolm Smith who swiped the ball and returned it 69 yards for a touchdown, which would help him earn the Super Bowl’s Most Valuable Player title. The score then became 29-0 after Percy Harvin took the opening kick in a sensational 87-yard return to open the second half, and then it became a cannibalizing 36-0, while the Denver Broncos could only continue to bleed agony and confusion before they were even able to get on the scoreboard, and that came only at the end of the third quarter, while the score as the final whistle blew would be 43 to 8. The XLVIII Super Bowl was one of the most lopsided games in history, while San Francisco's 55-10 defeat of Denver still remains the record.